Love fiction with a big heart? Once Leota's garden was a place of beauty, where her flowers bloomed and hoped thrived. It was her refuge from the deep wounds inflicted by a devastating war, her sanctuary where she knelt before a loving God and prayed for the children who couldn't understand her silent sacrifices. Now, eighty-four year old Leota Reinhardt is alone, her beloved garden in ruins. All of her efforts to reconcile with her adult children have been fruitless and she voices her despair to a loving Father, her only friend. Then God brings a wind of change through unlikely means: one, a college student who thinks he has all the answers; the other, the granddaughter Leota never hoped to know. But can the devastation wrought by keeping painful family secrets be repaired before she runs out of time? 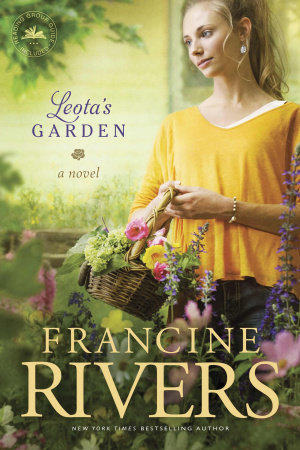 Leota's Garden by Francine Rivers was published by Tyndale House in March 2013 and is our 3443rd best seller. The ISBN for Leota's Garden is 9781414370651. I read Leota's Garden last year, after book was given to me by a friend from church after we had a discussion about need for forgiveness. I started reading and couldn't avoid reading from its pages every time I had an opportunity. The Bible truths are so well expressed in depth yet at times with such a sense of humour, that it left me at times laughing, and other times crying for what the old lady had to go through. Loved the young girl's character. I was so blessed, and learnt the truths of how forgiveness helps heal families with deep rooted issues and bitterness. Now I am buying this book for a good friend, hoping she enjoys it as much as I did. Got a question? No problem! Just click here to ask us about Leota's Garden.